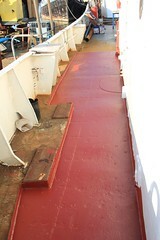 The next section of deck rust busted, and a first coat of primer on. A long day for all, but well worth it. It was a busy boat this last weekend. We had a four day weekend last weekend, coupled with glorious sunshine. With friends down to help, this was the perfect setup for loads to be achieved. 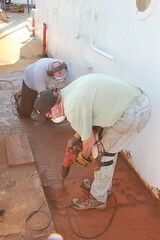 Here you see Steve, in the foreground, and Lee rust busting the port side of the deck. I had gone over this section last year, but rust never takes time off. Now it all has to be done properly again. 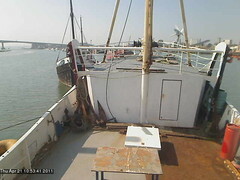 The eagle eyed amongst you would most likely have spotted the webcam image to the right of my blog page is now updating. Yup, I've finally got my webcam up and running, and just today upgraded the camera to a slightly better model. To see it in all it's glory, go to my webcam page here. It should now stay up more or less permanently, unless there is some kind of communication problem of course. What I've done, is implemented the webcam on a Phidgets SBC (Mine is a slightly older model), the same SBC I use for reporting voltages, temperatures and pressures. The reason for using an SBC is it hardly draws any power at all, yet does a respectable job as a Linux computer in it's own right. It's all still a bit of a work in progress, of course. The story of my life I guess. 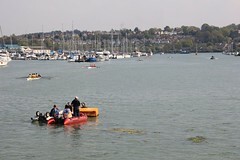 What with one thing and another, it was a busy weekend on the River Itchen this last weekend. Sunday they had a rowing regatta on, so the river was littered with all kinds of crews battling it out between them. I could not really tell who was winning or not, but there was plenty of grunting and shouting going on. This is, most likely, the last post I'll make on the LED's progress. The LED has been reduced to a tiny pinprick of light, even after bypassing the resistor. So that's the end of that particular experiment. Who would have thought that that light would have shone continuously for nearly nine months? Some proper posts on their way shortly, promise. 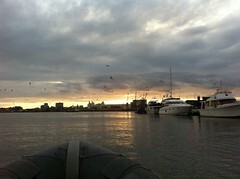 Coming back down the River Itchen the other evening, suddenly there were gulls everywhere. There was nobody else around, and no reason that I could see that brought the gulls down. Could be there was a school of fish, or something else interesting in the water I could not see. There is always something interesting going on around me. 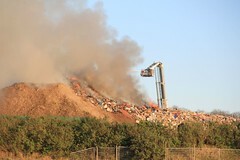 Here you see a huge fire in the yard near me. As best as I can tell, without going there for a visit, I believe the yard is some kind of topsoil recycling place. They seem to feed soil through a large drum shaped sieve, separating the rubbish from the soil. I suppose they had not disposed of their rubbish in a while.. It took the fire brigade about three hours, or so, to finally put it out.